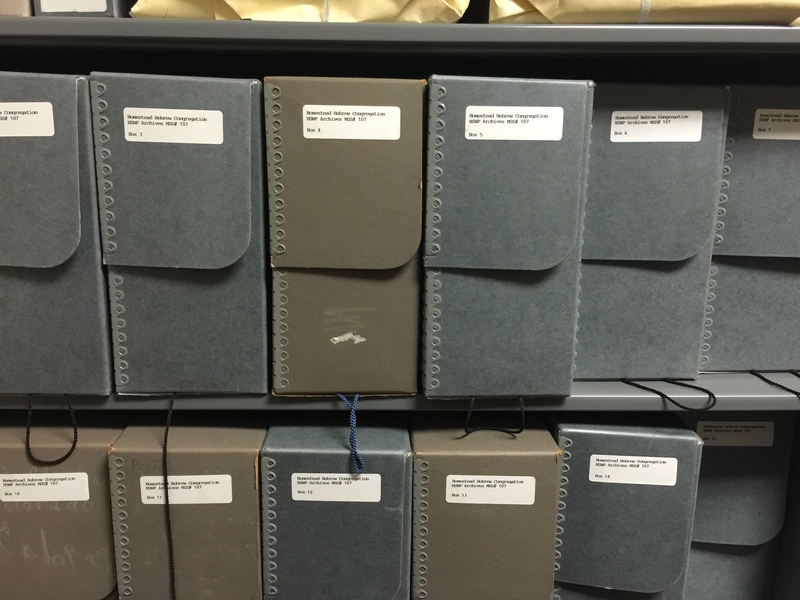 Some of the boxes of Homestead material in the Rauh Jewish Archives (March 2015). I’m greedy. I’ll admit it. 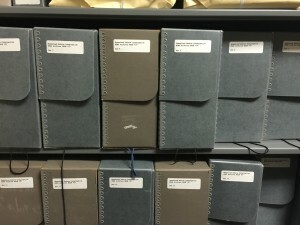 There are sixteen boxes of records and 2 books from the Homestead synagogue in the Rauh Jewish Archives — and yet, they’re not enough for me. And I’m envious, too. For as rich as these records are, I see things in other synagogues’ records that we don’t have, and I wonder why such items didn’t survive for our shul. 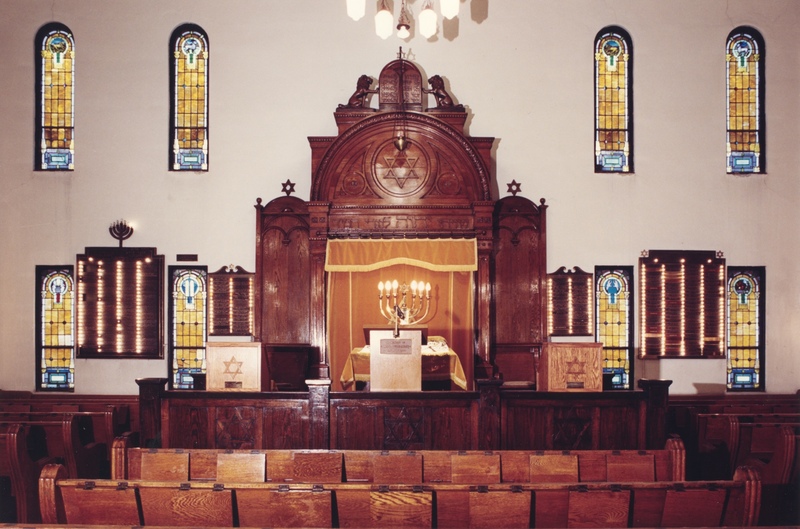 All of the records found in the synagogue before it was sold were donated to the Heinz History Center, but not all of the records that were ever created by Homestead’s Jewish organizations made it to that fateful date. The first congregational minutes, dated June 28, 1920, says they are for meeting #652. 652?!?! Where are the minutes for the first 651 meetings?!?! If the first meeting was held March 13, 1894, that’s two meetings per month for the previous twenty-six years that we don’t know about, covering all the history I personally find most interesting. 1 As a result almost everything I know about this time period comes from the Homestead newspaper, an incomplete source at best, or from the congregation’s own financial records covering this period, which are a very oblique way of gathering history. Update September 2017: I learned that when Congregation Beth Shalom took control of the cemetery and its assets, the controller of the synagogue discovered that certain bond certificates were missing. In an attempt to locate them (because it is not cheap to re-issue them), he called banks all over Pittsburgh to see if they had anything. The bank at Bartlett & Murray indeed had a safe deposit box in the name of the congregation, and the controller even had a key that matched the box… and inside there were… just a few pens. And nothing else. There is another vexing gap in the minutes for another crucial period. One volume of minutes peters out at the end of 1950. The next volume begins February 3, 1963. Although the volume that ends with 1950 is not completely filled up, given that the preceding volumes all cover roughly a decade, it’s possible that the secretary — my cousin!, Dr. Morton J. Keisler — felt it better to start a new book, rather than abandon minute-taking altogether. When the minutes pick up in ’63, their style is consistent with the style from thirteen years prior, so it suggests that there were minutes from these missing years that disappeared somehow. Annoyingly, this is the period when the congregation began to decline and even contemplated a possible merger with a new synagogue in Pleasant Hills. I wish I could better understand how that transition happened step-by-step, when the leadership acknowledged the change, and if/when they contemplated altering their course. There were numerous other Jewish groups in town, none of whose records survive at all. The congregation’s sisterhood, though, was considered part of the synagogue, but only one decade of their minutes, 1945-1955, survive. This period partly overlaps with the 13-year gap in synagogue records, which is nice, but still… there must’ve been more minutes both before and after! I emailed all the national organizations with very little success in gleaning information about the Homestead chapters, so other than mentions of these groups in Pittsburgh’s Jewish newspaper it’s unlikely this gap will ever be closed. Construction on the first synagogue began summer 1901, it was converted into apartments after November 1913 (how very Lower East Side), and in-between it was adjacent to the Second ward school, itself an important landmark in Homestead. Why are there no pictures of it? Why isn’t it peeking from the background of a school picture? All I’ve found is this rough drawing from a contemporary map of Homestead. Seriously, why are there no pictures of either ground-breaking, cornerstone-laying, or dedication ceremony? Why are there no pictures of synagogue officers of boards of directors? Why are there no pictures at any of the anniversary celebrations? Why aren’t there more Hebrew school class pictures? Formal confirmation class pictures? I’ve seen such pictures from other congregations, so why not ours??? I find it impossible to believe that no such pictures were taken at the time. Sometimes the synagogue minutes allude to pictures and plaques that hung in the synagogue, but did not end up in the archives. Old photographs I’ve seen of the vestry rooms also show pictures and banners I’ve never seen in person. Where did these end up? Why so few programs? Most of the ones I have came from individuals who kept theirs, and not from the synagogue records, and even these collections seem to fairly underrepresent the number of events that had programs, from what I can tell. And what about synagogue bulletins? In his 1993 oral history, Marshall Gordon recalled, “I remember a couple of us kids one year in Sunday school put together a little Sunday school newspaper. Wrote it, distributed it, took it to Sunday school every Sunday and passed it out to people with just little gossipy items about people and things that were happening.” (This would have taken place in the early 1940s, I’d guess. And in the 2/7/1949 board meeting, Joe Frank urged “a monthly mimeographed bulletin be issued by combined efforts of all Jewish community organizations, cost pro-rated among all. Publicity committee will investigate feasibility.” It’s unclear what came of this effort. And the A.Z.A. also apparently had a paper — on 5/3/1949 the board discussed that the “AZA has a paper & the Cong should make contributions to the paper.” 3 Leya Moskowitz, the wife of Rabbi Moskowitz who served in the 70s, told me she had saved newsletters from the shul, though by the time I called her she didn’t have them anyone. Researchers into the strike have proven unable to discover if early employment records for the Homestead steel mill actually survive… so I haven’t even tried. I’ve seen some for other Carnegie mills, but never Homestead’s. It would be the only way to know for sure if any Jews were employed in the mill at the time of the strike. What happened to Jacob Ackerman? On December 1, 1946 the following took place in a synagogue board meeting: “A motion…authorizing the Sec’t to send the required papers to the proper authorities for entrance into U.S. for Mr. Ackerman from Braddock who has a brother, a Rabbi, who is at present in Czechoslovakia.” I have to assume this man was a survivor, and the congregation was trying to get him out of post-war Europe. Later than month the congregation went as far as to draft Articles of Employment for Rabbi Jakob Ackerman for two years as assistant rabbi at a salary of $2400/year. The contract was to begin when the rabbi would arrive and report for duty. But the synagogue records don’t indicate that this man ever served at the synagogue or was paid. The envelope in which I found this contract relates some genealogical information: Jakob Ackerman. Born 1907 Nov 15 in Zaluz, Czechoslovakia. Lives now Bratislava Czechoslovakia Zamocka 66. 4 I eventually found this man’s ship manifest (indexed incorrectly under “Jakuo Ackerman”). He arrived in NY harbor in June 1948, bound for the Homestead Hebrew Congregation of Homestead, PA. But did he ever actually go there? The only Ackerman in Braddock in the 1940 census was Joseph Ackerman, but this man’s descendants knew little about this generation of their family. Another lead was the Craig Ackerman named on the Sisterhood Tablecloth, but Danny Stein, whose name was included in the same square, had no idea who this was. For the early decades of the community, it is a safe assumption that the families observed the commandments around Taharat HaMishpacha, family purity. These rules required women to go to the mikveh monthly. As foreign as this observance may seem to many of us today, it was crucial for our ancestors’ family life. The Chafetz Chaim (a rabbi from Belarus, 1838-1933) wrote that it is forbidden to reside in a city that has no mikveh, and building a mikveh “enjoys priority over building a shul, purchasing a Sefer Torah or any other Mitzvah” (source). So… where did they go? I am fairly certain there was never a mikveh in the current shul. I’d be surprised if there were one in its predecessor. It’s unlikely they would have had the necessary privacy (and safety) to use the river. Was there one in someone’s basement? Did they have to travel to Pittsburgh or McKeesport? AP: Were people so religious that they used a mikvah? Do you recall? LB: I remember my mother saying, you know, that she went to the mikvah, but I don’t know if it was in Homestead or where. AP: Mm-hmm. That’s what I was wondering. LB: I, I really don’t know. There was a short-lived, break-away congregation c. 1906-1908. Here is everything I know, which is not very much. At this point I’ve exhausted every source recommended to me by the “experts,” so it’s a very long-shot I’ll ever learn more. The first synagogue was burned in an arson. No one was ever caught. Many Homesteaders accused the Jews of burning their own synagogue for the insurance money. The Jews pointed out that there had been a spate of arsons in Homestead at the time. Who was responsible? More than a century after the crime, I don’t actually expect to ever answer this question, either. Where did the aron kodesh (ark) come from? The itemized report of building expenses submitted by my great-grandfather doesn’t list it, nor do any of the shul expenses from that period. I think somewhere I read that someone brought it back from Hungary? That doesn’t seem feasible. 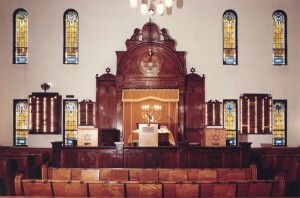 I’d love to see pictures of the ark in the Homestead Hebrew Chapel in Congregation Beth Shalom before the 1996 fire, but I don’t think any were taken. Yes, I’m 99.99% certain that there is a time capsule in the cornerstone of the shul, but (a) if the newspaper is correct and complete about its contents, then I’m fairly convinced I already have the important items in there, and (b) I can imagine no way, even if I had all the money in the world, to remove the time capsule without risking damage to the building. And I actually quite like that the building is standing, and I can visit it. So that’s that. Finally, I’m pretty sure that if a picture of the Rodef Shalom Congregation Bomber still existed, it would be a fake. Oh well. 1901: Monongahela Trust Company was founded. 1959: Fidelity Trust Company merged with Peoples First, which created Pittsburgh National Bank. It’s good to have a wish list. Even better if it were circulated among people who otherwise would not know of your work. I stand in awe of the work you have done. As always, I enjoyed reading about your research and your comments about my grandfather. I hope as your research becomes more visible to the general public that some insight into the items in your wish list will be revealed. Thank you for the picture of the Ark. It brings back many memories.